This baby monitor is good value for money; can speak to baby, play music, put a light on all via the app. if wifi is down it cannot be used and has to be fixed to the wall and has no clip to clip onto the crib for ease. I really recommend this video monitor from Phillips advent! It has high quality pixels and sound, you can check on and sooth baby! Also has a handy night light! You can wall mount it and position it any way! The Avent uGrow SCD860/05 Smart Baby Video Monitor uses SafeConnect Technology to reassure you and your baby wherever you are. 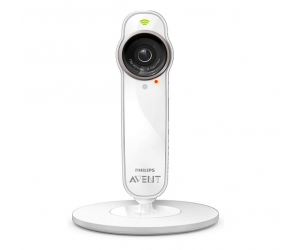 This baby video monitor enables you to watch over your precious little one. The accompanying app will automatically switch between networks to optimise audio & video quality ensuring you don't miss a snuffle or movement of your baby. Relax, and trust the reliability of the Avent uGrow Smart Baby Video Monitor.